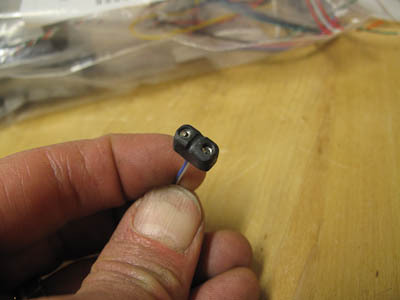 #13 is the second build that includes a piezo loaded bridge. #9 was the first, but the time from completion to delivery was so short that I had little time to play around with them. This time, I have tried them through a couple of different amps and am very impressed. 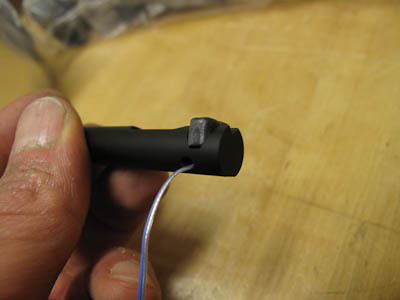 Here are a few pictures of the work that goes into installing them – it is fairly manual labor since having custom saddles manufactured becomes reasonably priced only when the quantity is very high. I start with GraphTech piezo equipped saddles for Wilkinson tremolos and saw off just the front portion. I then put them up in the milling machine and mill them down to the correct thickness. The next step is to shape them roughly. I usually do this on a Dremel with a disc grinder. I make sure the fit into the custom bridge/tuner housings. These have been modified from the original by having a slot where the saddle would normally sit, and a hole for the wire to go through. 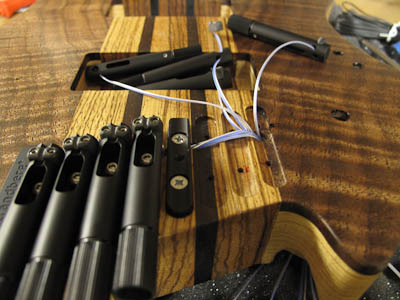 Next, after some final finishing work, is installing them into the guitar. I now rout a gradually deeper channel under the bridges themselves. 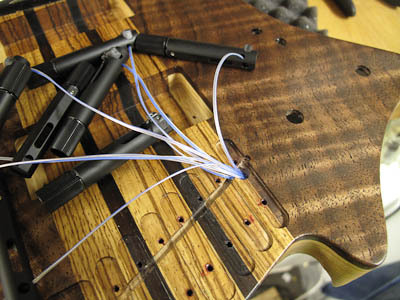 Each cable is hidden under the next bridge, ensuring there is some slack for intonation and string height adjustment. 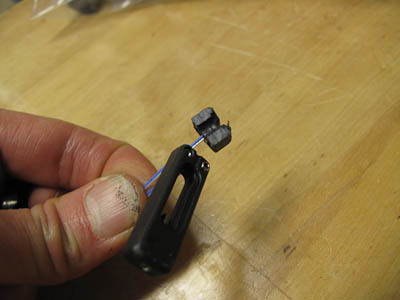 The final assembly also includes a string grounding cable that the 1st string needs to be threaded through. 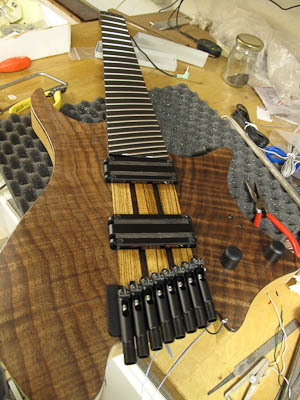 The other strings are grounded through the zero fret. This assembly can be used with for example the GraphTech Acousti-Phonic pre-amp, but also with the Hexpander pre-amp. Beautiful work. I would never have thought of repurposing Graphtech saddles that way. Thanks for showing this. Great idea, and thanks for showing how to do this. 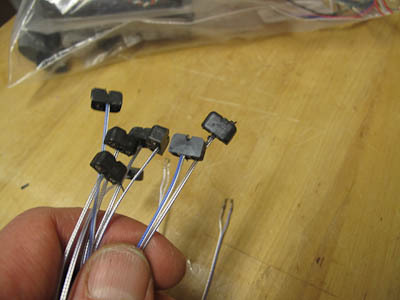 Do you offer your fixed bridges pre-loaded with Graph-Tech piezo saddles for purchase, or is this an end-user-only DIY modification? I have had some prototypes available for this, but more work is needed to put it into production. 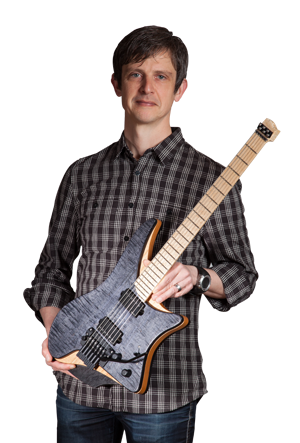 I would love to get a Boden 8 with piezo pickups (with or without the 13-pin MIDI interface). Are there any plans to offer this option on the Bodens? Or is going full-custom the only way to get this feature? 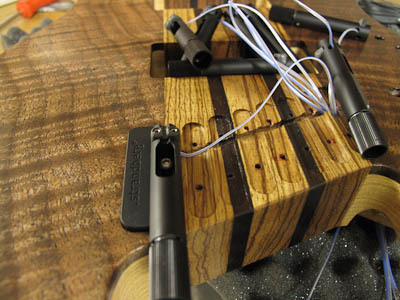 Hi John, we have been talking to Graphtech about making custom piezo saddles for our bridges. Now that we have some volume of sales, it is suddenly feasible to get 1000 pcs done… Having said that, there is a lot of work involved, so we will see when/if it materializes. In that case, it would definitely be a possible for the custom shop guitars and not just M2M. Your guitars look fabulous, and I would love to try one someday! Hello sir, fellow guitar nerd and humble fan of your work here! If I may ask, what potential do you see in the Cycfi Research Neo pickups that lies beyond a piezo setup such as this, in conjunction with the Antares Autotune for Guitar system’s pickup modelling capabilities? I’m very excited over the Neos! In fact, I’m waiting to receive some prototypes to see what they can do. An issue with the Boden design is that there is very little space to mount electronics and the Antares system needs a lot of room. But who knows? Thomas Nordegg (Steve Vai’s guitar tech) is completely sold on them.